Paul Moran - Smokin' B3 Volume 2 (6/4/18). 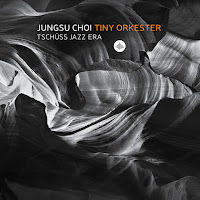 Jungsu Choi Tiny Orkester - Tschuss Jazz Era (29/4/18). Daryl Sherman - Lost in a Crowded Place (27/4/18). Sheila Jordan w. Pete Churchill. International Jazz Day @ The Globe (30/4/18).